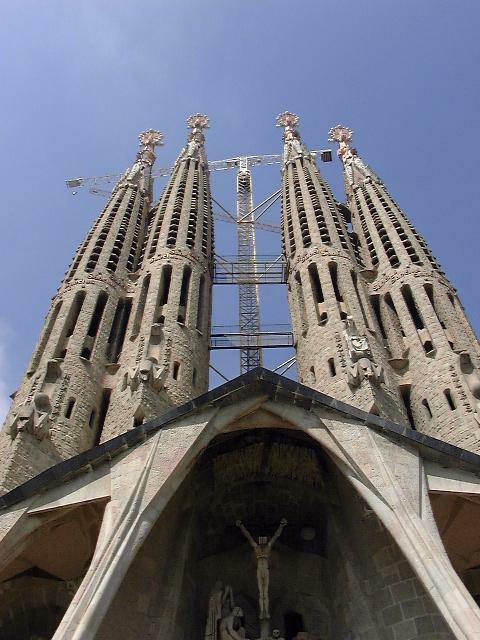 Barcelona is the second largest city in Spain and the capital of the province Catalunya. Catalunya is like Quebec in that it has its own language and cultural identity and isn't all that thrilled about being associated with a larger, governing country. 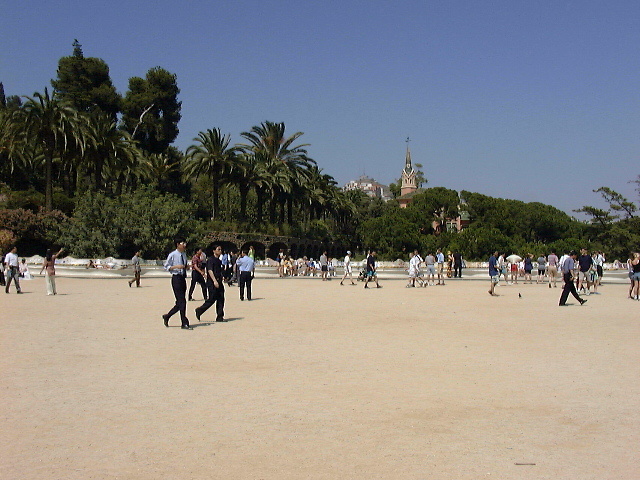 Catalunya has been declared an "autonomous community" by Spain and has its own national police force. 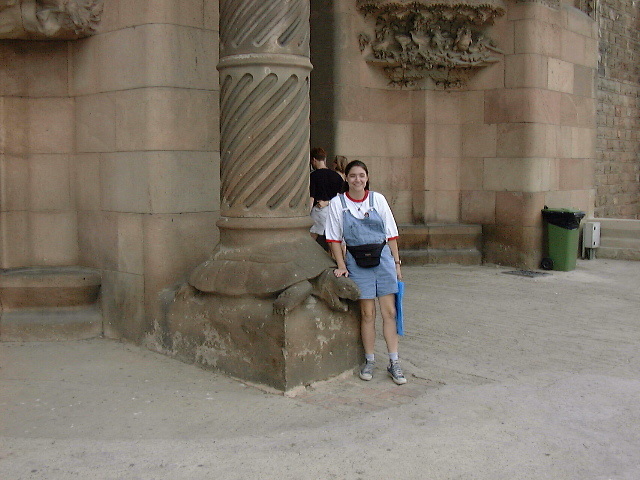 The main reason we wanted to see Barcelona was to visit several buildings by the architect Antonio Gaudí, a native Catalunian who lived from 1852 to 1926. 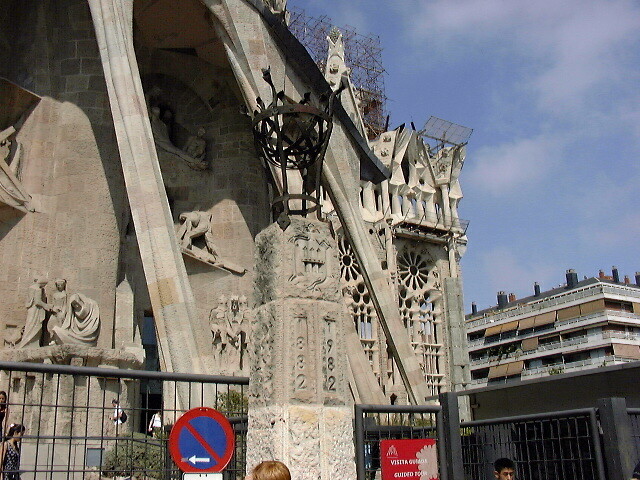 Most of his works are located in and around Barcelona and are classified as "modernisme", part of the Art Nouveau movent. 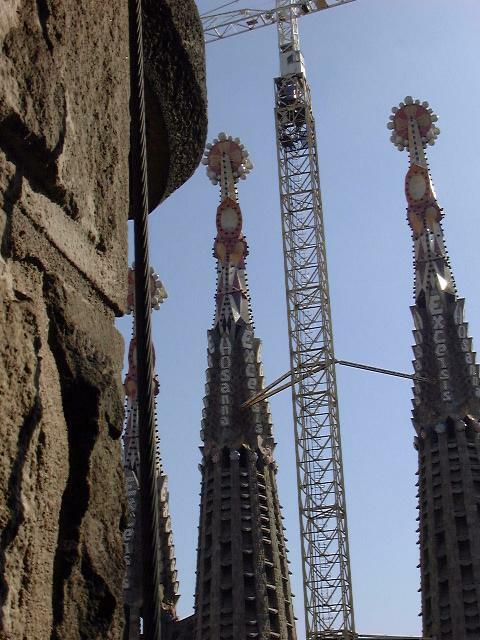 The Sagrada Familia Cathedral (Cathedral of the Sacred Family) was started in 1882 by another architect, but was handed over to the young Gaudí after the first architect left the project. 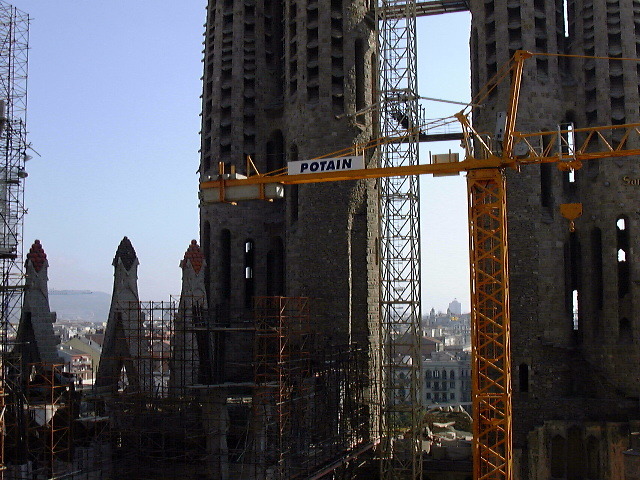 Gaudí took plans for a traditional-looking cathedral and transformed them into a huge, unique structure which is still being constructed today. 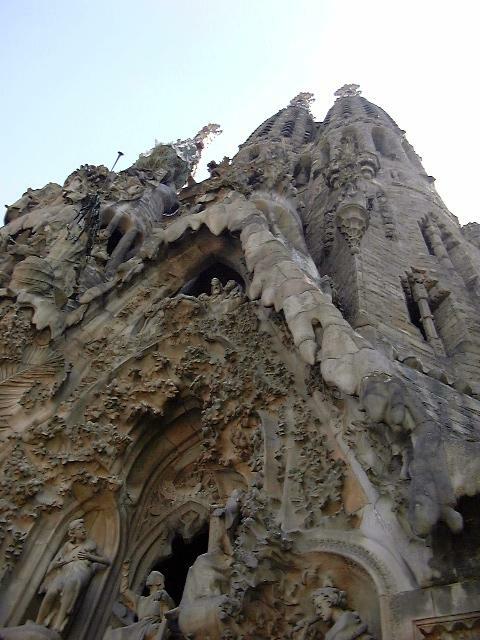 This is the facade that was completed in Gaudí's lifetime. It is very organic with flowing figures and forms. The animal carvings are very realistic, much to Megan's delight. Everywhere you look in this facade you discover something new peering out at you. Two chameleons that flanked the facade. The one on the left is going after a tasty bug. 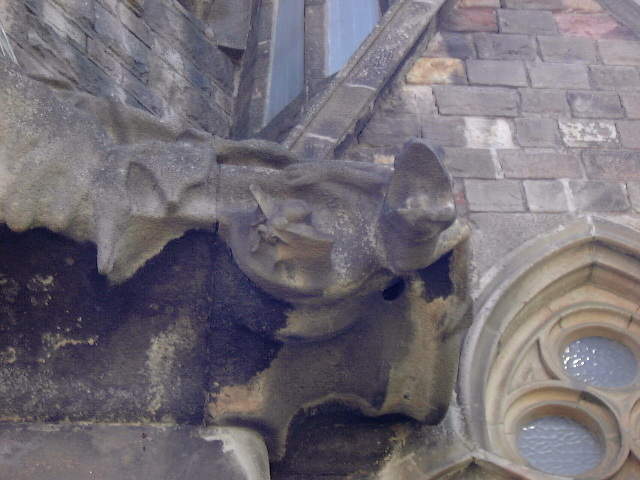 The tortoise supporting one of the main columns. 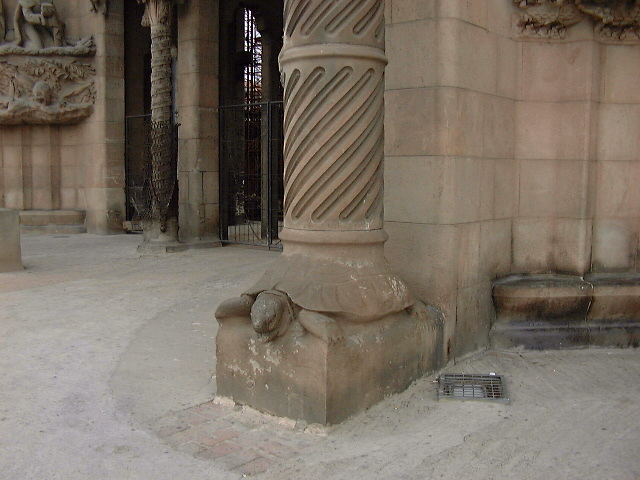 The other column was supported by a sea turtle. The infant Jesus, the Virgin Mary, and the donkey that carried them to Bethlehem. 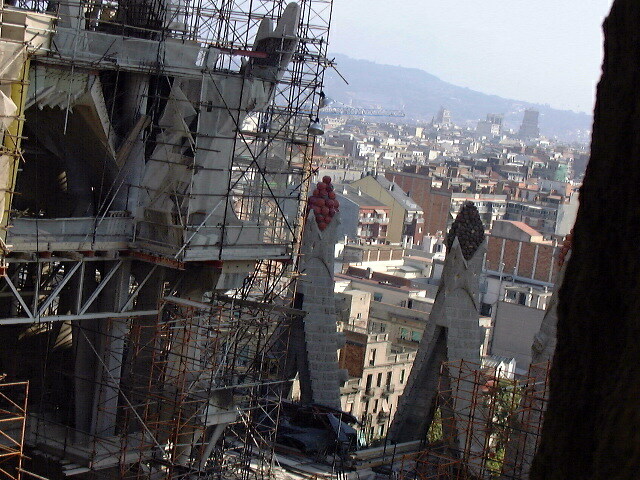 When Gaudí told city officials that he needed a donkey as a model, they brought him the "prettiest donkey in Barcelona." 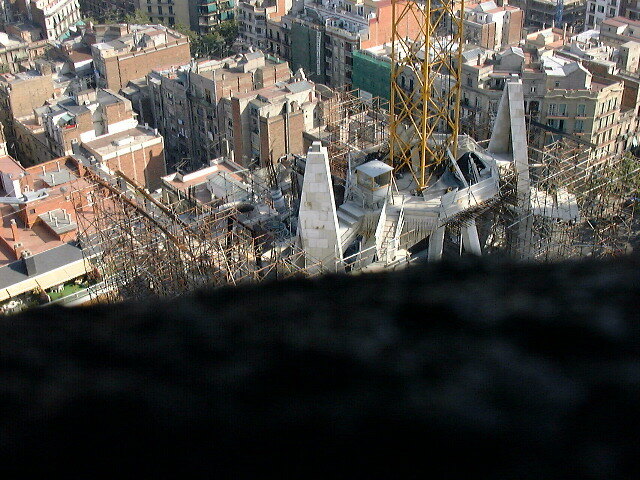 But Gaudí wanted realism, and saw an old woman with a run-down, tired old donkey pulling a flower cart down the street. 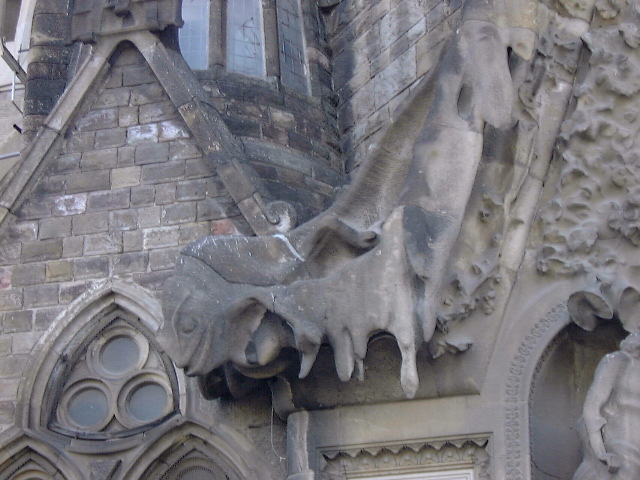 Gaudí finally convinced the reluctant woman to let him borrow her animal, but when she saw her donkey covered in plaster to make the molds, she started to cry because she thought her donkey was going to die. 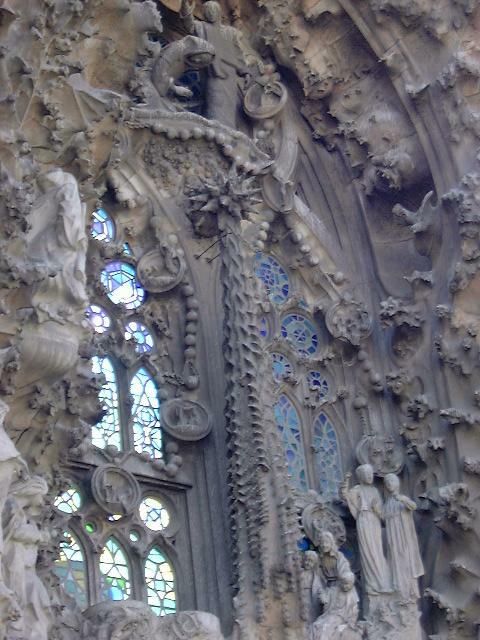 (This is one of Guy's favorite stories about the cathedral). One of the few areas with stained windows installed. It looks like a few windows were put in place to see if they would work out and the rest left until some undetermined later date. This shot is taken from the outside; there is sunlight streaming through the windows because the building behind them is not complete. 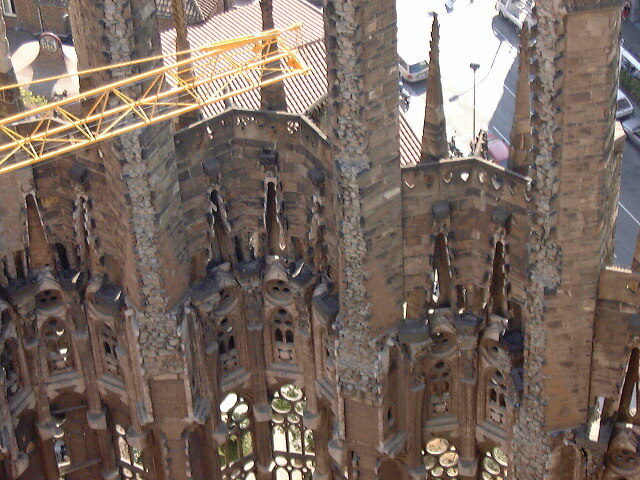 The top of the facade and the towers rising overhead. 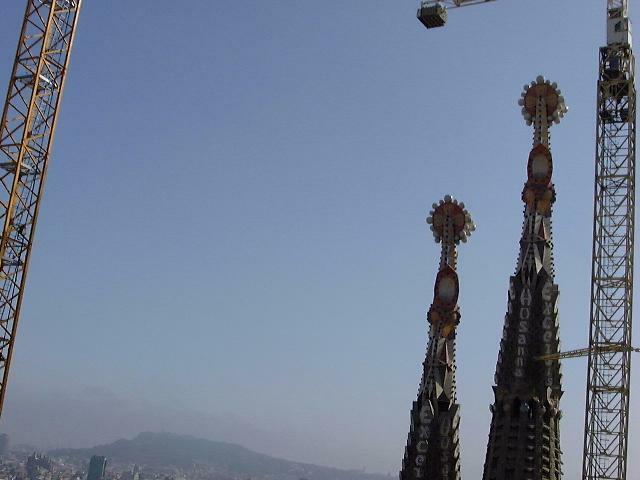 When people complemented Gaudí on how nice the brown stone of the facade looked, he would reply that he was planning on repainting everything in bright colors once it was complete. This facade was very recently completed. 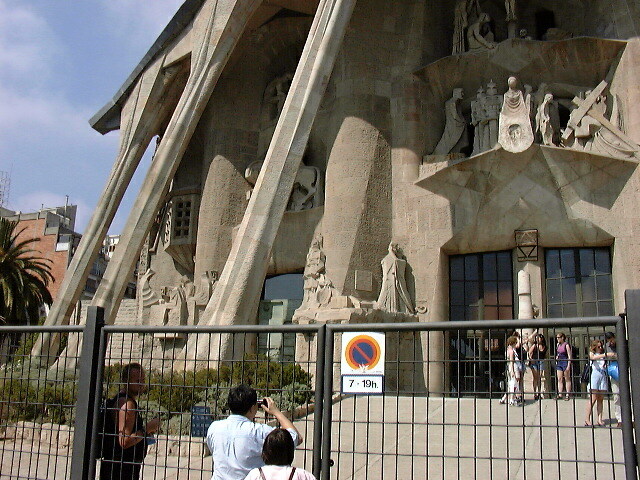 The figures are by the sculptor Josep M. Subirachs. 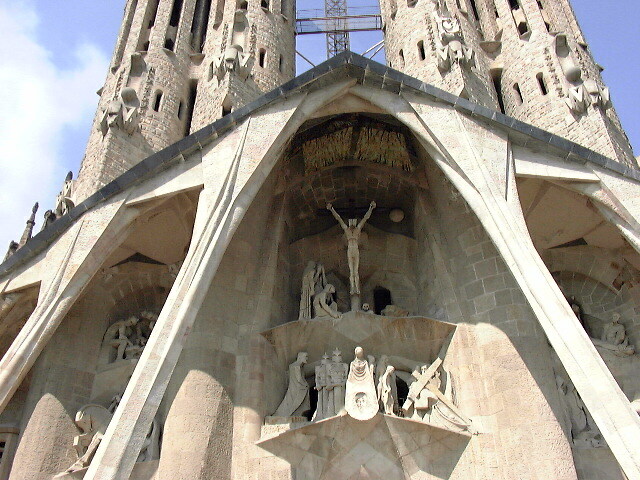 This facade is very different than the Nativity facade, but the sharp angles, straight lines, and austerity reflect the somber theme of this work. 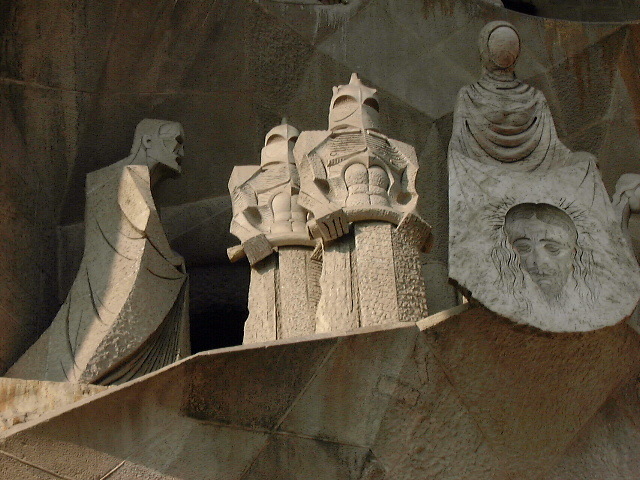 The heads on these soldiers are supposed to be reminiscent of the chimney sculptures on the Casa Milá, another one of Gaudí's works. I don't think the resemblance to Star Wars Stormtroopers was intentional. 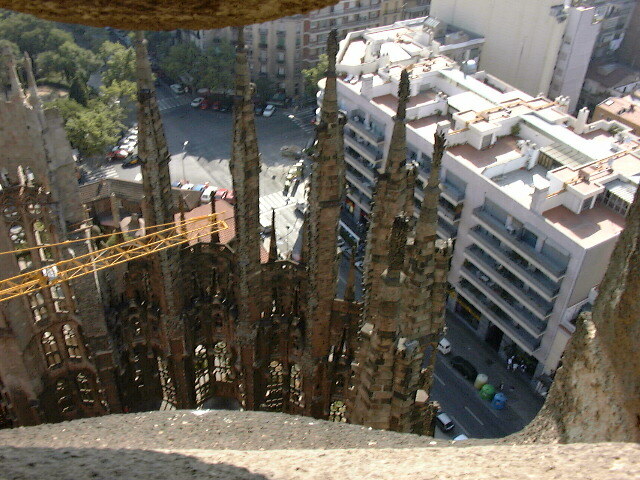 Photos taken on our climb to the top of one of the ... ft towers. The stairwell was narrow and packed with people going up, down, stopping to take pictures, stopping to conquer their fear of heights, trying to get on the elevator, trying to get away from the elevator (which I overheard one person describe as "being built by 19th century sadistic munchkins").... But we made it to the top, where the German next to me broke out into "It's the End of the World as We Know It" by REM. International travel is fun. 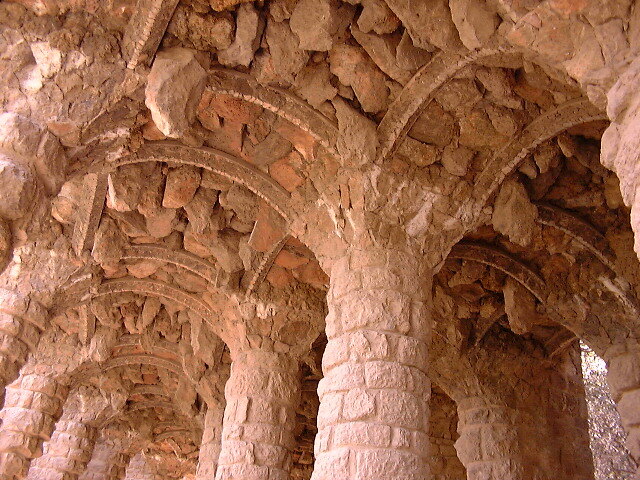 The smaller structures with brighter stone are the windows to the nave. Each window is topped with fruit, colored by mosaics. 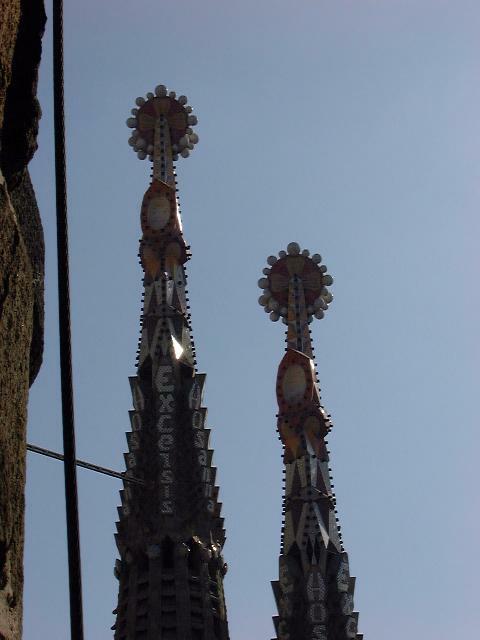 These towers have "Excelsis" and "Hosana" spelled out at the top, along with brightly colored mosaic crosses. These photos do not capture the neon-bright intensity of the colors when seen in the sunlight. 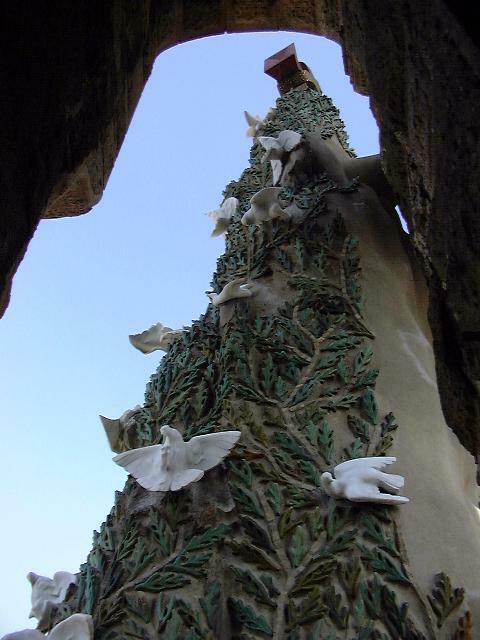 The Nativity Facade is topped by a cyprus tree and white doves, which you could get close to by walking along the connector between the two sets of towers on this side of the building. 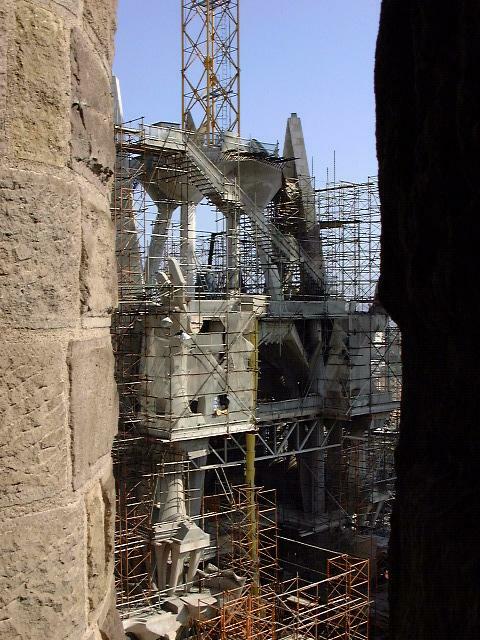 As this structure is funded by public donations, visitors are allowed to view the construction in progress. 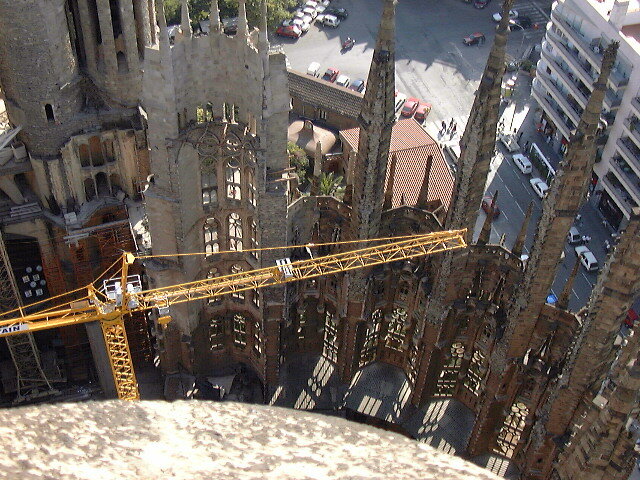 We visited on a Sunday and did not get to see anyone working, but wandering around the site was impressive. 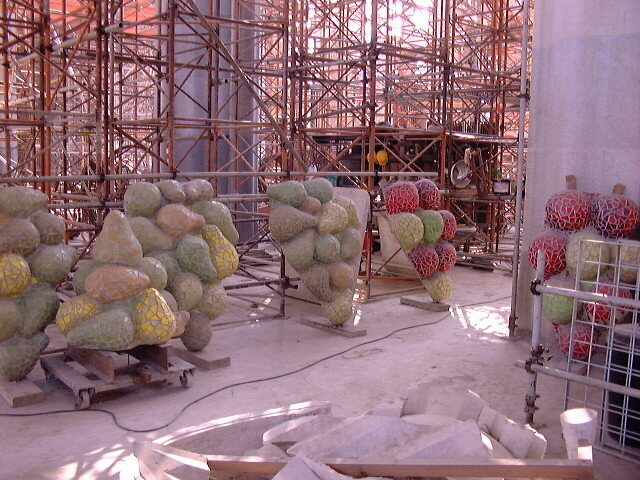 More fruit, ready to be placed on top of newly constructed nave windows. 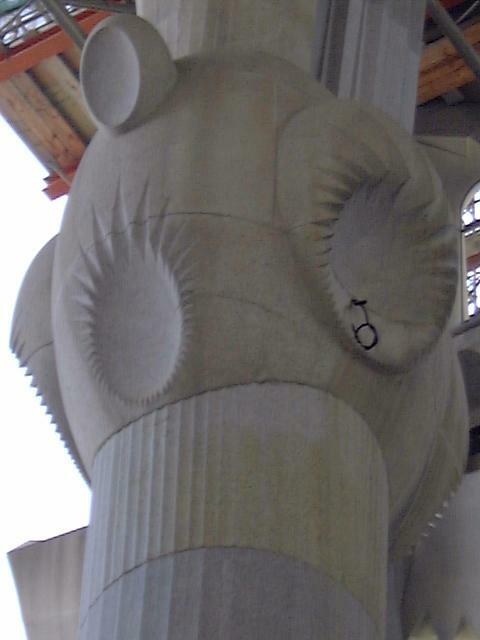 Part of one of the columns of the interior nave. 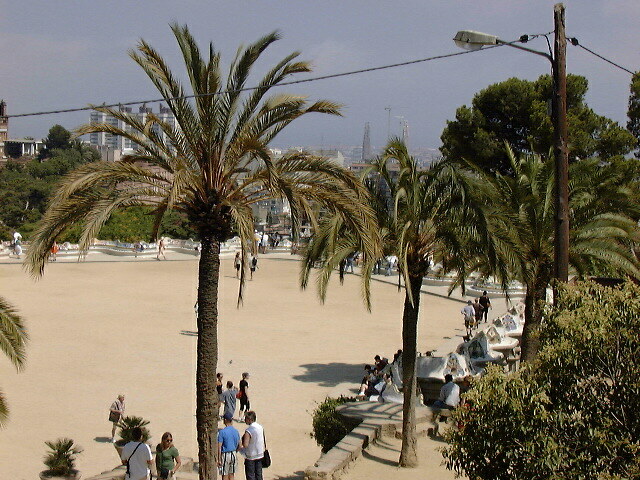 This public park originally began as a project to build a subdivision on the (then) outskirts of the city of Barcelona. 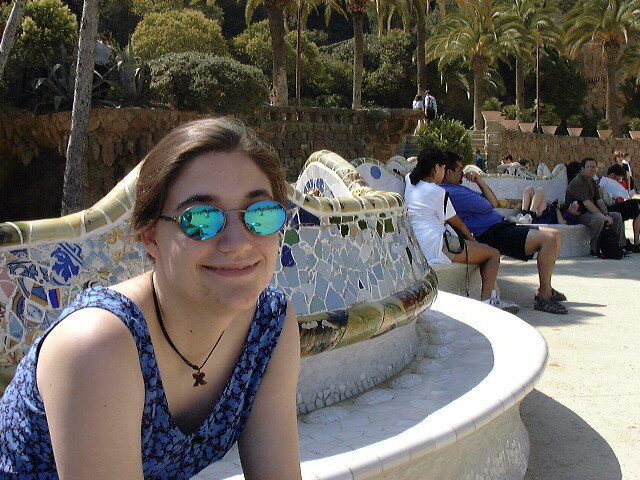 Gaudí's long time patron Eusebi Güell commissioned him to design 60 houses that were to be nestled on a garden-like landscaped hillside, along with areas such as plazas and shopping centers that were to build a sense of community for the residents. 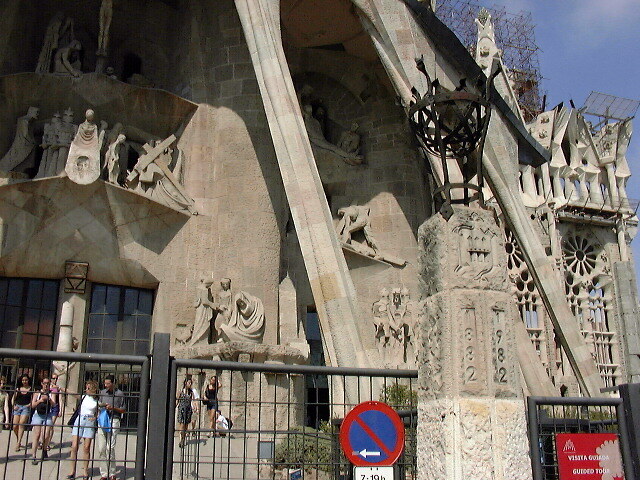 Gaudí worked on the project from 1910 to 1914. Only two houses, along with a plaza and marketplace, were ever built. 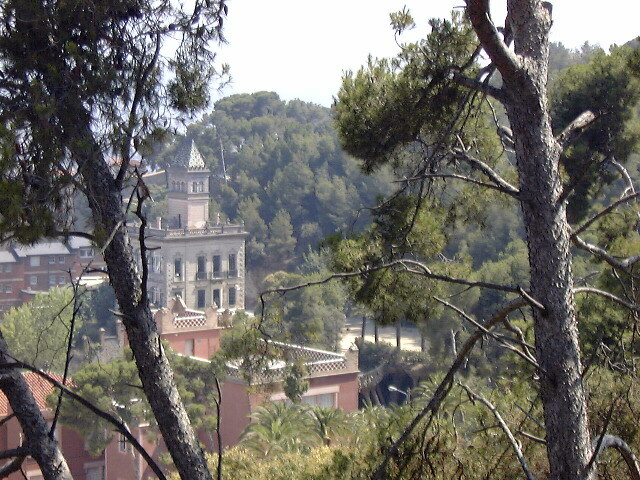 The area was opened as a public park in 1922. Views of the plaza. There were signs up that read "No soccer playing". 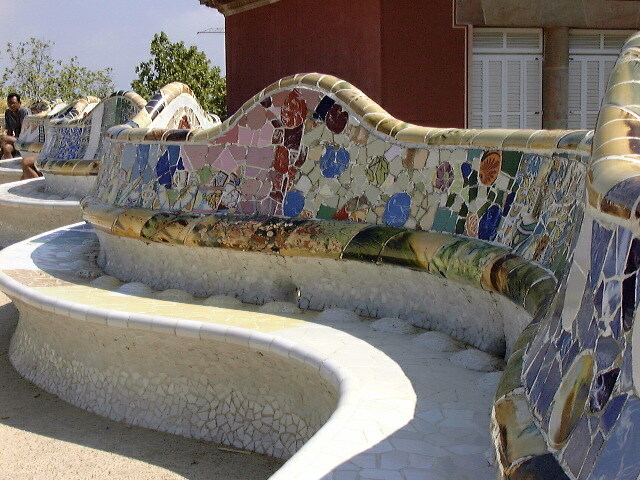 This long, snakelike bench covered in mosaics winds all the way around the plaza. The back side of the bench acts as a water collection unit- when it rains, the collected water flows to a reservoir. When the reservoir becomes too full, water drains through several fountains in the park. 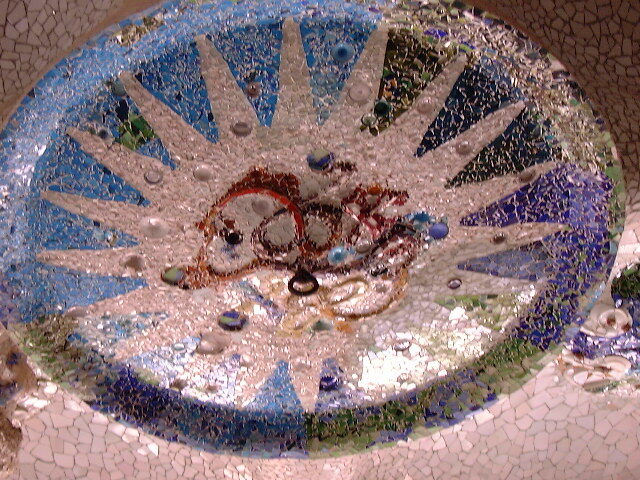 A detail of the bench mosaic. 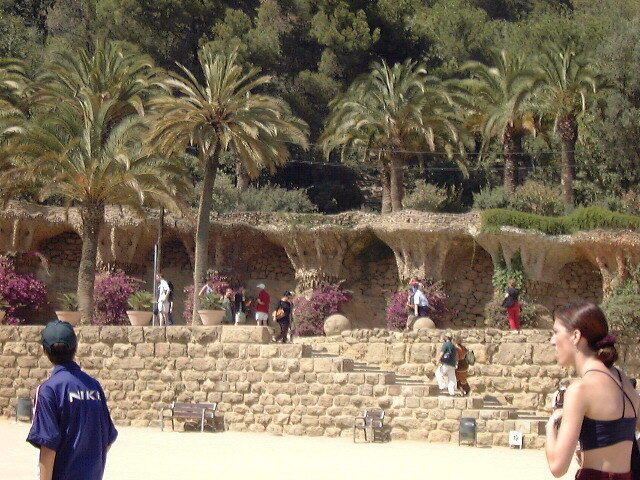 Landscaped walkways through the park. 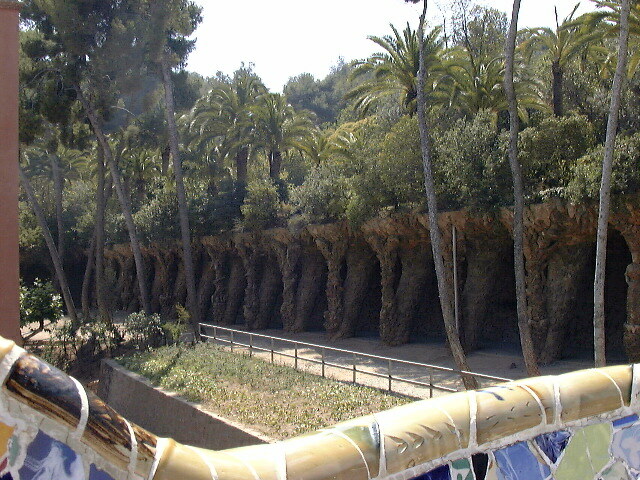 Gaudí wanted the roads and walkways to harmonize with the natural surroundings. 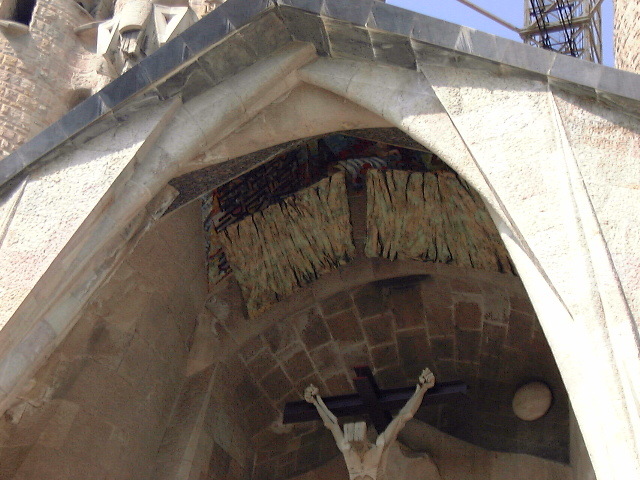 Detail of the ceiling of one of the walkways. 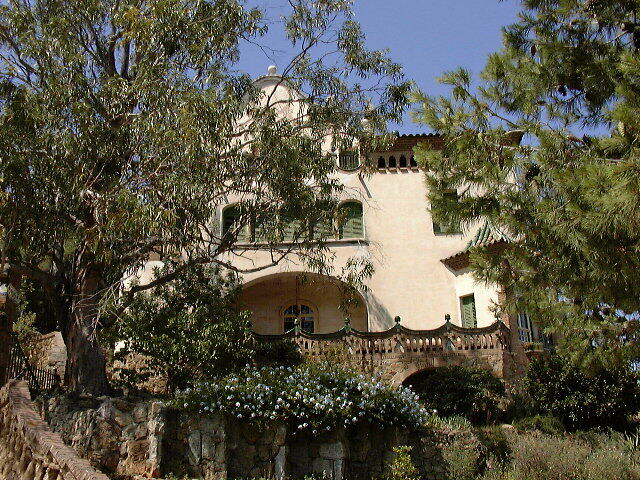 One of the two residential houses in the park. 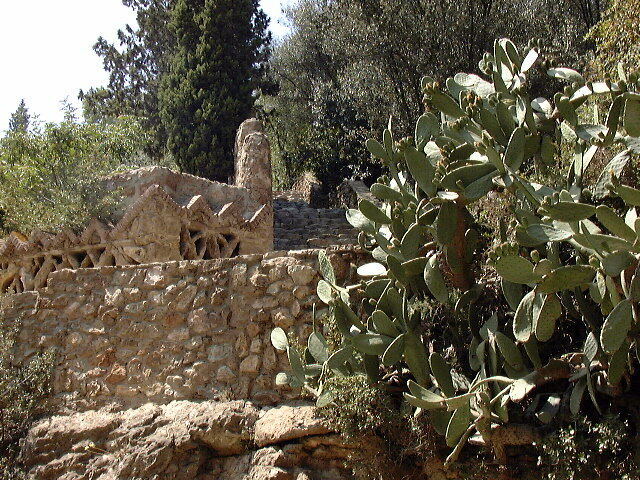 One of the guardhouses at the entrance of the park.